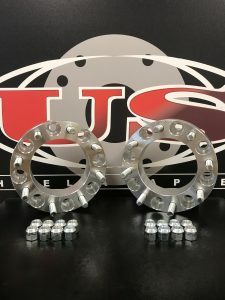 US Wheel Adapters stocks pre-built 8 lug wheel adapters in lug centric designs. We also custom build lug centric and hub centric wheel adapters using all American machinery, materials, and hardware. Pre-built adapters ship same day if ordered before 2pm Central Time. Custom built 8 lug wheel adapters have a build time of 5-7 days. Adapters take 2-3 days after shipping to arrive. These adapters can be used on ALL 3/4 ton, 1 ton trucks, vans, and SUVs. They can also be used on 1+1/4 Ton and up using 8 lug count hubs.